I'd Like to see all alien-themed UTAU! Discussion in 'UtaOC' started by idol, Mar 18, 2017. When my first UTAU was being created, I based their design on the classic 'Alien' motif (With sickly green + neon green), and an anime called Tsuritama! I'd never seen the anime, but I liked the shapes in their hair and the cute short hairstyle of one of the characters!! Do you know any alien UTAU? I know a few like UFOko and Uchuupoids, and I love them very much! It's silly, because as soon as i posted this I started looking at your utau! Thanks for sharing! I think there's one I came across called Setebos. Well, I have two planned. 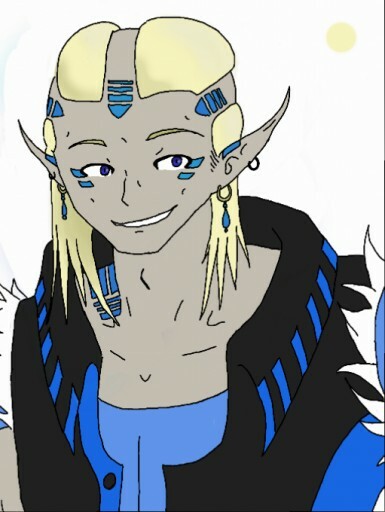 A sort of alien/elf hybrid type thing. I do have a picture of the one of them here. Not quite finished yet, but that is a priliminary sketch for the one that is half alien, half human. Gotta finish the drawing of the other one. idol and Kuro_Miku like this. Are we talking, like traditional "greys" or just generally alien? 'Cause CHROMA is an extradimensional creature that based their humanoid form off their first encounter with a human scouting ship (each single-color morph takes more after an individual crew member, but they're all composites). Granted, I've yet to finalize their appearance beyond very broad strokes (I've scrapped a few designs because I was dissatisfied with them :v) and I haven't been able to record much due to health... but that's the plan.